Control Resources’ custom electronic design and manufacturing group provided power electronics consulting services in developing this variable frequency drive with power factor correction. This variable frequency drive accepts a single phase power source and provides variable 3-phase power to control a 1/3 HP motor load. Our power electronics consulting engineers designed this product to meet power factor correction of more than 90% with harmonic distortion of less than 10%. Our motor control consultant engineers optimized this variable frequency drive to accept an analog control (0-10 VDC) signal or MODBUS communication link. CRI’s ISO 9001:2000 registered electronic design and manufacturing facilities have the capability to provide complete power electronics consulting solutions from prototype to production. 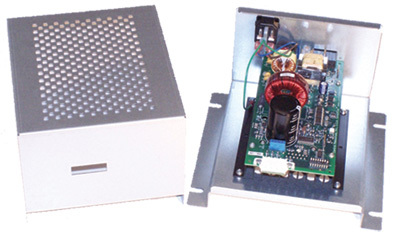 Mechanical: Drive installed in 2 piece steel enclosure and wired with fused power input module.